- because the muscles involved in that particular phase of the squat are weak. - because that particular area involved in that particular area of sticking is an area of poor leverage. (A) Making the squat more difficult by changing the angle or by using a special device. (B) Isolating the weak muscles involved in sticking by using assistance exercises which work the muscles involved in a similar but different angle than that of the competition squat. We will explore both techniques separately. There are several exercises that you can do to make the squat more difficult and consequently strengthen your competition squat. First, simply take a light weight out of the rack and do squats with a close stance, bar up high on the trapezius muscles, and go all the way down, keeping the back straight. This is the 'Olympic squat' and it isolates the legs, requiring less usage of the lower back and hips, and puts the lifter at a lower depth, thereby making this lift much harder to use the heaviest weights on. Another exercise is the 'Pause' squat. In this exercise the lifter comes to a full stop at the bottom and pauses briefly before ascending. It can be compared to the difference between a touch-and-go bench press and a dead stop bench. In this squat all momentum is lost and the longer one pauses, the harder it is to arise. Wrapping your knees may be necessary on this one, as it tends to stretch them. If you enjoy this exercise but find that it gives discomfort to the knees, you can try the same thing except you sit down on a milk crate or box in the lowest position. This is a very popular West Coast exercise called the 'Low Box' squat. It eliminates the knee 'stretching' that many lifters experience in a pause squat. Simple sit on a strong milk crate or box and ascent at will. One of the best assistance exercises for the squat is the Front squat, used frequently by Olympic lifters. Hold the bar racked across the front deltoids with palms under it. Take a close stance. This isolates the legs because it is difficult to lean forward without losing the weight out front. 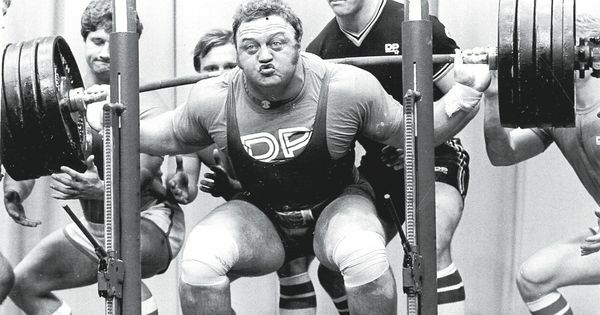 There are three more front squat variations warranting explanation here. The first is a front squat with the hands and wrists crossed up on top of the bar rather than under it. This makes the leverage shift even more to the legs. One slight lean forward and you'll lose the bar forward. The next variation is the 'Thigh' squat, once again developed on the West Coast. Take the bar off racked in a front squat position with fingers under the bar. Descend as usual, but upon ascending, thrust the hips forward and lean back slightly. This puts all the stress on the thighs. Our third and final variation of the front squat is the 'Sissy' squat. It, too, was developed on the West Coast. Put your heels on a 2-inch board for balance. Hold the bar on the front deltoids with arms crossed up on top of the bar. Now lean back and put hips forward, concaving the body forward. Keep this position and start squatting. You will find that this exercise will burn even without weight on the bar, so start slowly and lightly. While executing it, always lean back, never come forward. For a few other squat assistance exercises, you may try squatting Olympic style with heels propped up on a 4-6 inch inclined board. This is called the 'Incline' squat and once again puts a great deal of stress on the thighs. Use a close stance of about 11-12" wide. You will find that you cannot lock out your knees due to the extreme incline. This is an asset as more stress is placed on the lower thigh. Finally, doing an Olympic squat without locking the knees (continuous tension squat, non-lock squat) can also serve to greatly strengthen the thighs and prevent knee injury. Choose one exercise of your choice from the above. Do it once weekly in addition to your regular squat. Perform it after squatting on the same day or on another day at least 3 days from your squat day. Also, do the exercise in higher reps than your competition squat so as to focus power on the competition squat only. Before utilizing various assistance exercises which develop the squatting muscles, one must find out exactly which phase of the squat is weak and know which muscles are involved in this weak phase. 10) Squats on isokinetic machines. All of the above exercises can be done in the '1-1/2' rep system. This is descending below parallel, coming up half way, going down again, and arising all the way up. This constitutes one rep and helps concentrate on the low sticking point of the squat. It is rare that anyone would devote a whole chapter to only one assistance exercise. However, the good morning exercise, or the 'bendover' exercise has the potential to increase your squat and deadlift on a one-to-one relationship. That is, each time the good morning is improved upon, so too could the squat and deadlift automatically. This would greatly help reduce the amount of assistance exercises utilized since it works two of the contested lifts. The good morning exercise is also very unique in that it is one of the very few exercises which isolate the hips and lower back in almost the same way as executed in squatting. Most assistance work for the squat emphasizes the legs, or all the squatting muscles together. It is difficult not to emphasize the legs as we must go below parallel. However, the hips and lower back, in conjunction with one another are much stronger than the legs and are used throughout most of the squat. Here we have an ideal exercise which isolates the two groups in almost exactly the same way as used in squatting. Just think of how those two muscle groups can be strengthened while leaving out the legs and not causing extreme fatigue. Before implementing the good morning in your routine, make sure that you have no back issues. If you do, it is possible to use the exercise as a remedy for that problem, but with extremely light weights only. If your back is healthy and sound, you will soon be able to handle substantial weights with this exercise. No matter what purpose you use it for, always stretch thoroughly first . . . upper and lower hamstrings, and the entire back and hips. After this warmup, very slowly work into the exercise using the first month to acquaint yourself with the style and feeling of the lift. Here is how it is performed. Hold the bar one inch below the top of the deltoids. Bend the knees from 10 to 20 degrees to relieve the pressure on the hamstrings. With control, look up and bend over until your back is at a 90 degree angle or parallel to the floor. If you are not sure of your position, check your position with light weight using a mirror until your acquire built in depth perception. Repetitions are your choice but I would recommend 5 sets in the following manner: 10,5,5,5,5. My personal routine has been: 135 x 5 | 185 x 5 | 225 x 5 | 325 x 5 | 420 x 5. Once again, if your back be sound, there is no reason to believe that you cannot work up to big poundages. Perform it once per week for 6-8 weeks and see if your squat and deadlift don't markedly increase.